1. Cool Purple Planes with Funny Names. 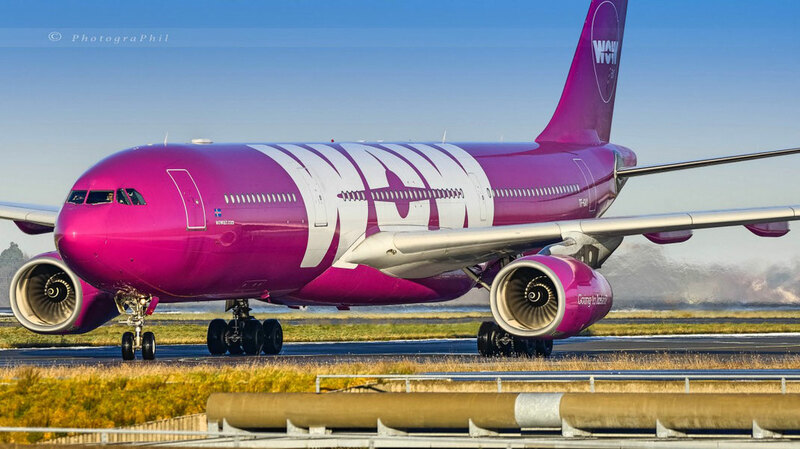 Painted top to bottom in its signature purple, WOW air has some of the most recognisable planes in the sky. 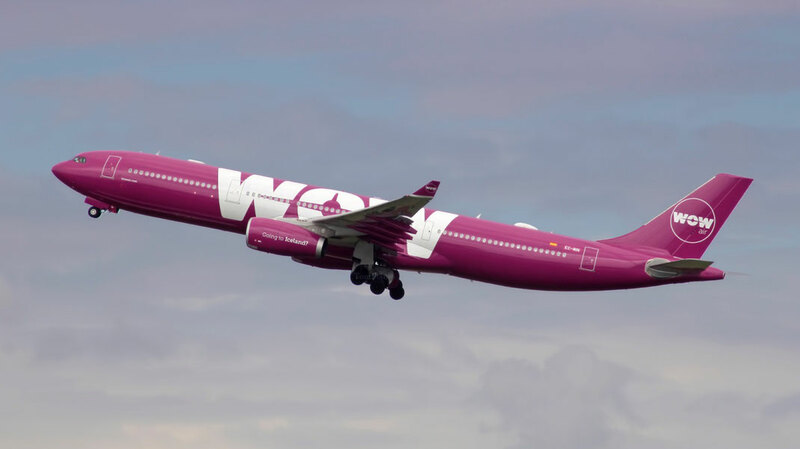 The simple livery found on most of its aircraft consists of a mostly purple fuselage with “WOW” written in white across the middle and the question “Going to Iceland?” written in white on each of the engines. Almost as cool as EVA Air's Hello Kitty Planes. Additionally, WOW names all of its aircraft with the last three letters of their registrations. Some aircraft names include MOM, DAD, GMA (Grandma), GPA (Grandpa), JOY, DOG, WOW, LUV, etc. 2. WOW Air operates an all-Airbus fleet. The airline operates an all-airbus fleet for its transatlantic flights to and from Iceland, a common trend for low-cost carriers as it reduces pilot training costs and simplifies maintenance on the aircraft. 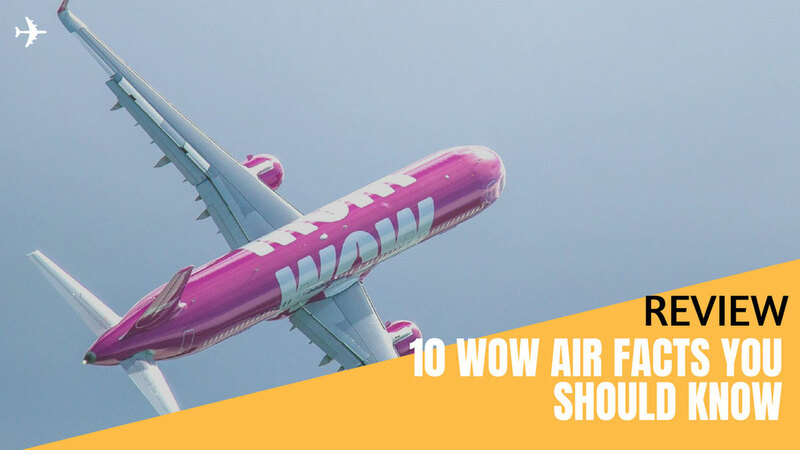 WOW’s fleet consists of the Airbus A320, Airbus A320neo, Airbus A321, Airbus A321neo and Airbus A330-300. The airline has an order in for the new Airbus A330-900neo to serve its low-cost route network. The all-Airbus fleet is the complete opposite of rival Icelandair's all-Boeing fleet, which includes the new Boeing 737 MAX 8. 3. 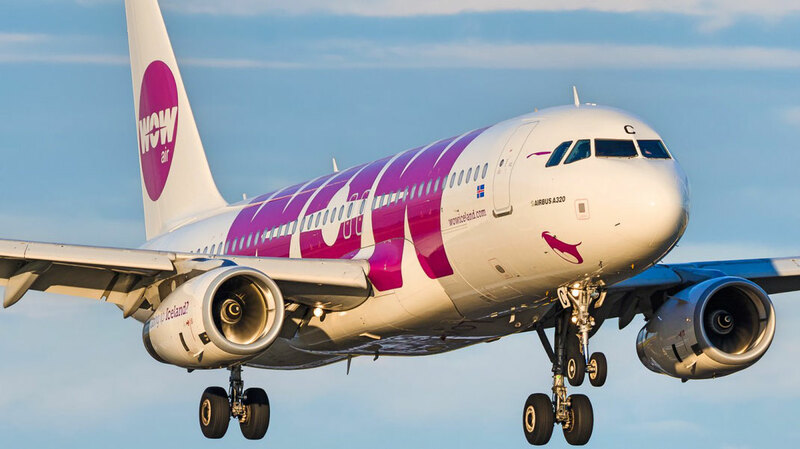 WOW Air operates the longest A321 flights. When the larger A330s aren’t available, WOW sometimes uses its long-range and fuel-efficient Airbus A321neos to fly the longest routes in its network including Reykjavik-Los Angeles and Reykjavik-San Francisco. The flights are nearly 9 hours and are some of the longest routes the aircraft flies for any airline. The next longest route the airline uses its A321 aircraft for is Reykjavik-Tel Aviv, which is almost 2 hours shorter at just over 7 hours. 4. The first low-cost carrier to serve India. WOW recently announced flights to the Indian subcontinent beginning in December 2018. The airline will be the first low-cost carrier to serve India from Iceland and will do so using its Airbus A330-300 widebody aircraft. At nearly 12 hours on the return flight, the route will be the longest in its route network and will take WOW’s aircraft the farthest from Iceland they’ve ever been flying under WOW. While Icelandair has hinted at India service, WOW is the first airline to connect North America and India via Iceland. 5. WOW Air offers iPad's for rent. As a low-cost airline, WOW doesn’t feature any complimentary in-flight entertainment onboard its aircraft. For passengers that forgot to pre-download entertainment or want to watch newer movies while traversing the skies above the North Atlantic Ocean, the airline rents out iPads to use during the flight. As in true low-cost fashion, the iPads will cost around $20 to use for the duration of the flight. Just like AirAsia X. 6. Big Seats instead of a Business Class. Despite not offering a premium cabin on its aircraft, WOW offers large seats, called “Big Seats” on some of its aircraft. The seats are comparable to business class seats which feature greater seat pitches, extra legroom, additional recline and tray tables in the armrest. With WOW’s random seating selection for passengers choosing not to prepay for seats, its possible to be randomly assigned one of the Big Seats without paying extra, although you won’t receive any of the extra service. Also, not all of WOW’s aircraft feature the product, so you won’t always know if you’re seated in the product until on the plane. 7. 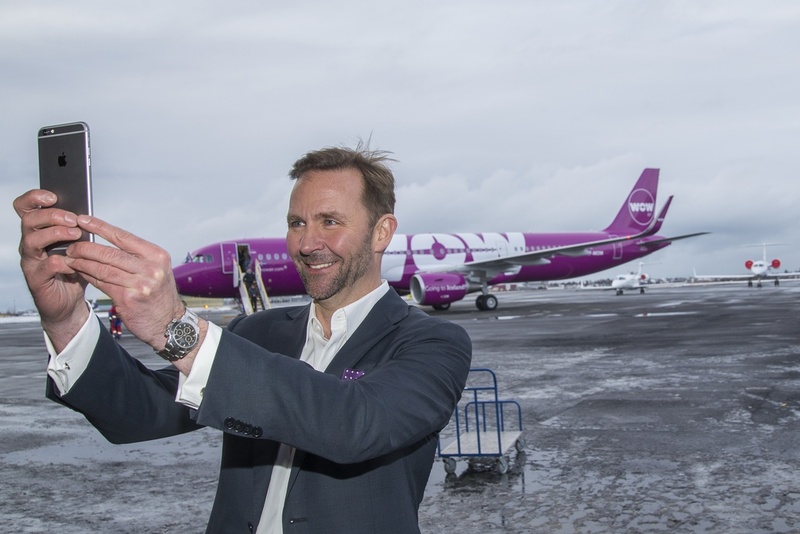 WOW Air's CEO never worked for an airline before. WOW was founded by Skuli Mogensen, an Icelandic tech entrepreneur that founded the company following the success of his communications company, which he sold to Nokia in 2008. The airline is owned by Mogensen’s investment company, Titan, meaning that he both owns the airline and runs it as CEO. Under Mogensen, the airline grew from a smaller intra-European airline to a transatlantic low-cost carrier serving both North America and Europe using a strategy pioneered by Icelandair. 8. Keflavik Airport is WOW Air's main base. Keflavik International Airport serves as WOW’s main base of operations. From Keflavik, Iceland’s primary international airport, WOW serves destinations in both North America and Europe, with flights to India coming at the end of the year. The airline shares the airport with Icelandic flag carrier and main rival Icelandair. Although the T-shaped terminal is specially configured to handle passengers transiting between the two continents, the addition of WOW and its newly-launched transatlantic flights have made the airport incredibly crowded at peak hours and in need of an expansion. 9. Waged an Expansion War with Icelandair. In its quest to be a low-cost alternative to rival Icelandair, WOW has initiated a major expansion throughout the United States that has left Icelandair struggling to keep up. The airline has started service to cities such as St. Louis, Cincinnati and Pittsburgh, among others, and has been those cities first non-stop link to Iceland. The expansion has encouraged Icelandair to expand as well, starting new service to cities such as Kansas City, Cleveland and Dallas, while resuming discontinued routes to cities such as San Francisco and Baltimore. The result? Lower fares to Iceland than ever. 10. WOW Air operates a Bike Rental service. WOW air operates a bike sharing service in downtown Reykjavik called WOW citybikes. The service is comparable to bike shares found in major cities such as New York, Washington and London, and gives tourists a cheap and fun way to explore Iceland’s capital city. Tourists can rent the purple bikes from any one of seven bike docks located around the city. Additionally, the airline partners with Reykjavik’s bus company, Strætó, to offer a combined bus and bike pass giving passengers unlimited rides on yellow buses and 4 30-minute rides on WOW citybikes.